DESCRIPTION: Fabulous 33 acre estate. Main level: living rm w/ frplce, sliders to wrap-arnd deck, EIK, 3 fmly bdrm, 2 bth, pwdr rm, mstr w/ bth. Lower level: Main/nanny rm w/bth, lndry, wine cellar, pwdr rm, fmly rm w/ pool table, 60" TV, frplce, sliders out. Upper level: Card rm/office. Pool, pool house, tennis court, private 8-acre lake. YOUR MAMAS NOTES: Thanks to Belinda Beaverman, one of Your Mama's ever intrepid and eager researchers, we have learned that the Wang family, the Vera Wang family hunnies, has offered the Pound Ridge residence of the very recently deceased oil and pharmaceutical tycoon Cheng Ching Wang for lease at $25,000 per month. If ya'll will recall, Mister C.C. Wang, may he rest in peace, is Miz Vera's big daddy who bankrolled her bridal bizness and whose duplex apartment at the obscenely exclusive and expensive 740 Park Avenue Miz Wang recently purchased from the Wang estate for a reported $23,100,000. The genteel, rural, and rolling hills of waspy Westchester County, just north of New York City, are filled some of New York's more impressive and discreet communities where rich folks often own large (and sometimes huge) farms and estates. The hills and dales of Westchester County, sometimes referred to as the Beverly Hills of New York, are dotted with the rich and famous, including Bill and Hillary Clinton who "live" in Chappaqua–theoretically anyway, because Your Mama isn't sure how much time either of them actually spends there. Big bad Martha Stewart owns a famous and formidable farm up in Bedford (where she did her infamous house arrest), which is near Glenn Close's getaway on the unfortunately named Succabone Road. Financier George Soros has a krib in Katonah, and late night talk show king David Letterman owns a 100+ acre spread up in North Salem. In addition to the entire Wang crew, posh Pound Ridge claims Mike Myers, Richard Gere, and Susan Sarandon and Tim Robbins as residents, or at least part time residents. The C.C. Wang compound, located on Eastwoods Road is said to sprawl over 100+ acres, but the property offered to lease occupies only 33 of those acres and includes a very long driveway for celebrity style privacy and security, several outbuildings, a tennis/paddle court, heated swimming pool with pool house, acres and acres of verdant lawns, and a private and serene 8-acre body of water called Shackleford Pond. The 5,500 square foot 1970s contemporary, vaguely Asian looking, bunker-esque house is relatively modest by comparison to all the dee-luxe filthy rich folk amenities, which impresses Your Mama considerably. Certainly the C.C. Wangs could have afforded a much more lavish monster mansion. After all they did occupy that titanic duplex at 740 Park Avenue. 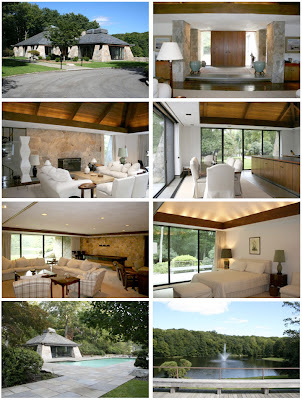 According to listing information, the bunker-like house includes a large living room with vaulted ceiling, 4 bedrooms, a walk out basement with a family room, a 60" television for sports freak and movie nuts, a wine cellar for the oenophile, a card room for playing Canasta and Bridge with all the Pound Ridge biddies, and a fifth bedroom in the basement for the nanny, because let's be honest, who wants to watch their own children at the weekend house? Perhaps a tough negotiator for the lease will be able to get the Wangs to toss in a complimentary membership to the nearby Pound Ridge Golf Club, which is owned by by Vera's brother Kenneth and scheduled to open in early summer 2008. Although it's really none of our beeswax, it's more than a little puzzling to Your Mama that the Wang children would put their dead parent's perfectly manicured Pound Ridge property out for lease. While neither Vera nor Kenneth would need the house themselves (they both reportedly have houses in Pound Ridge already), they certainly they can't need the income. Can they? Whatever the case, we presume the house will be leased to someone with a big fat Wall Street bonus who wants a home base while hunting to purchase a Pound Ridge spread of their own. Your Mama just hopes they have the manners and grace to remove their shoes off before putting their skanky feet on all that white furniture. I kind of like it. Reminds me of a house I stayed in on the big island of Hawaii that was also owned/built by wealthy Asians. Don't forget Rob Thomas and DMX in Mt. Kisco, Vanessa Williams in Chappaqua, Tommy Motola & Thalia in North Salem, and the burned down 30,000 square ft Mariah Carey mansion in Bedford. And Chynna Phillips in Bedford. Bill actually lives in the house with his mistress. My aunt is her personal shopper. Hill lives in georgetown D.C. In that first pic it looks like a REST AREA on an interstate highway. Either that or one of those state welcome centers. I wonder if there's a cruisy area in the woods nearby. I like this house. It feels as if it would be a very calm, serene house to live in. So_Chic, couldn't have said it better. Bring me my pocketbook. I dig the pavilion-like architecture. I had no idea that Rob Thomas and DMX were a couple. I like it, but as the pp mentioned, it looks like it belongs in Hawaii or South America. I hate when people build homes that don't match the location. I'm jealous of DMX. If Rob likes men, I want him. Vanessa Williams actually lives in Mount Pleasant. The house and outbuildings were designed by the late George van Geldern Architect. (Main house circa 1970's) The home is understated, zen-like and very serene. Remember, this was a weekend house for a family that owned cushy mansioned properties elsewhere. RIP George.